information to other companies or services. Claim it for yourself! Share it with others! What better way to celebrate your Rowdy Spirit than with the official poster printed on premium cardstock. Our exuberant Rowdy Girl frolics above black text accented by scarlet red and vibrant yellow, colors traditionally used to spur creativity. PSTR-S, designed to fit in a standard picture frame (measures 5"x7")is $5. PSTR-M, designed to fit in a standard picture frame (measures 8"x10")is $10. All posters are suitable for framing or displaying "as is!" A portion of the proceeds from this sale will help fund the Rowdy Recovery Program for the benefit of women who face serious health challenges. Spread the positive energy and recognize the Rowdy Girls in your life with one of our delightful greeting cards! 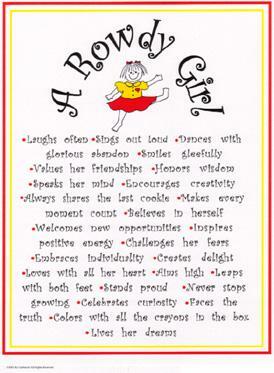 The front of the card bears the Tao of the Rowdy Girl with an inside message of "Howdy Rowdy!" A perfect acknowledgment of the recipient's Rowdy spirit. Send inspiration and wisdom to the special people who touch your life. Magic Happens When You Let It! Hugs from Me to You! There is ample space in the blank interior to include your own words of encouragement and hope. Printed on premium cardstock, each notecard comes with a matching envelope. Fire off a welcome jolt of positive energy to a friend! Make a Choice! Take a Chance! Perfect for propping up on your desk as a reminder of all the positive choices available to you or your fellow Rowdy Girls. Printed on premium cardstock, each postcard has ample room on the back for your own words of encouragement. For more information about the products and availability in your area, Contact Us Here! Keep in Touch or Show Your Gratitude, Rowdy Style! Energize your personal correspondence and express your gratitude as only a Rowdy Girl can! Printed on premium cardstock, each set of eight, 4 1/4"x 5 1/2," notecards comes with matching envelopes. Both designs are also available as postcards and come in sets of 10 cards.